As a popular tourist attraction in Yoho National Park of British Columbia, Takakkaw Falls attracts large crowds to this location regardless of the steep, winding road which leads to it. 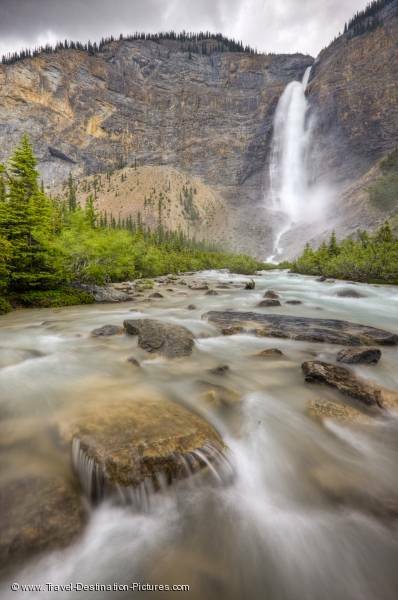 The waterfall, which is fed by the Daly Glacier, rages during the spring melt and is a spectacular scene and a top attraction for visitors to Yoho National Park - situated on the British Columbia side of the Canadian Rocky Mountains. The Takakkaw Falls plunge over a sheer rocky escarpment and the waters join the Yoho River which is fringed by lush forest. Park of British Columbia, Canada.